The Ten Toes paddle board brand is made by Retrospec. Restrospec started in cycles and expanded their outdoor product range to iSUPs, skates and Ski Gear. The Weekender, as it’s become affectionately known, is a stable iSUP that’s great as an all-rounder board. 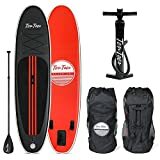 The price is not bad at all, and for your money, you’ll get a decent board that will allow you to experience the joys of paddle boarding. It’s an inflatable board, so it won’t take up much room on your camping trip. Sling it across your back when you’re out on the trail – it’s not much bigger than a sleeping bag when packed. Is it the right SUP for your needs, though? In this review, we’ll go over all the ins and outs so that you can make an informed decision. • Thickness: 6 in, which may seem excessive at first, but it makes it possible for the center of the board to bear more weight. If you prefer riding on top of the water, this is essential. • Weight: 30 lbs, so it’s not a lightweight, but it’s a lot better than a fixed board in this respect. • Paddle length: Adjustable, which is great when you need to transport it. It collapses to a meager three feet in length. It’s also good if you have smaller kids that want to use it. • Nonslip deck: The deck is designed to ensure that you can grip it well. The deck pad is high traction – you’re not going to slip off anytime soon, no matter how wet the surface gets. • A place to stow gear: The four D-rings connected by a bungee cord make it possible for you to easily and securely stow your gear. • Lightweight Paddle: The paddle is lightweight and made from aluminum, so it’s durable. • A good warranty: You get a fifty-day money back guarantee and a one year warranty against manufacturer’s defects. • The board, with its textured non-slip deck pad, D-rings, and more. • A total of three detachable rear fins. Being able to detach the fins is essential when you’re working in shallower water. • A hand-operated pump. Okay, pumping this thing up manually could get annoying if you’re going to use it often, so perhaps consider switching it out for an electric one if you can find one that fits. That said, the pump is there if you want to use it. • A repair kit. This comes with everything that you would need to repair a puncture. You’ll get PVC patches, adhesive, and a valve wrench. We were surprised that the repair kit was included as standard. Usually, it’s an accessory that you buy separately. • A replacement deck pad. This is a nice extra, we must say. No matter how well a board is constructed, it will wear over time. Having the extra mat is nice. • What did surprise us a little was that you have to pay extra if you want to have a carry case included. The bag is good quality, but we’d have expected it to be included with the board. This is an excellent option for beginners, and it will also work out well for slightly more advanced riders. It’s quite compact in size, so it would be better for smaller users. That said, there is more than enough space to perform yoga on it. You can use it to achieve a reasonable speed on the open water, and it will stand up to light surf. If you want to compete professionally, though, this option is not going to cut it. It’s built more for recreational use, and at that price you really can’t expect professional-grade equipment. We’d tend to say that this is a great model for performing yoga on or just enjoying some paddling. The non-slip grip is perfect for maintaining your grip when doing SUP yoga. It’s very comfortable as well. The paddle itself is not bad. It probably won’t cut it for more advanced users, but for beginners, it’s just fine. The smaller size of this board, combined with the adjustable paddle, make it perfect for those who are smaller in stature, or for kids. It couldn’t get much easier. You inflate it, step up on it, and ride. It’s easy to clean, dry, and pack away. The hand pump does make things a little more complicated, but not overly so. Still, we’d suggest switching it out for an electric version when you can. Surprisingly strong and durable, this model belies its lower price point in terms of quality. The company uses a drop stitching technique to ensure that the layers won’t come apart easily. The military-grade PVC layer is then put over the top to ensure extra toughness. 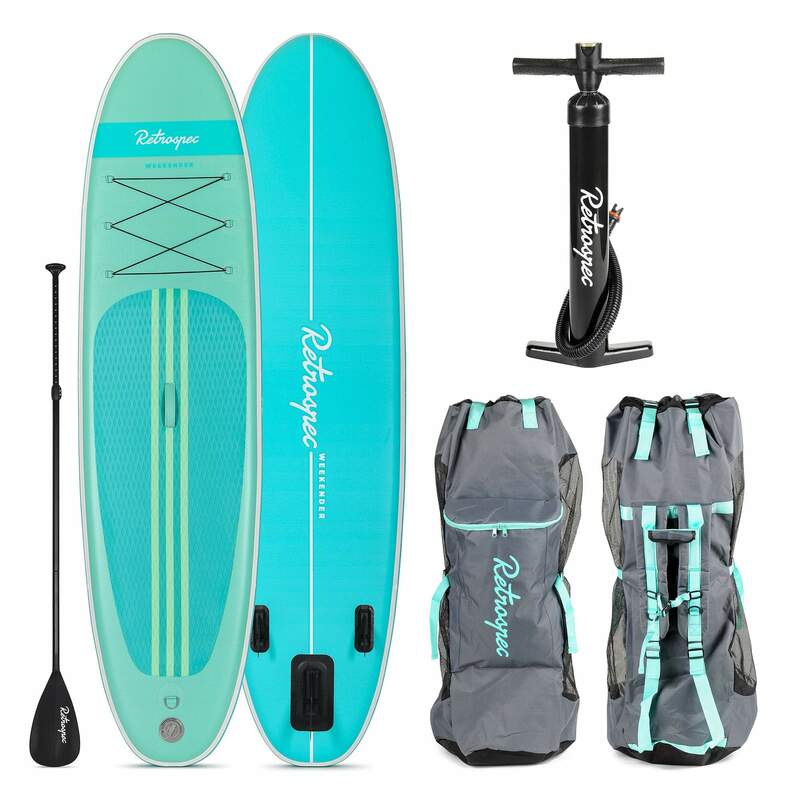 Performance-wise, if you’re using this for basic paddling and yoga, it’s going to be great. If you were thinking of competing with it, you’re bound to be a bit disappointed. You can get some speed out of it, but not enough to make it a competitive option. Most users love this model. Several have commented that the weight limit is merely a guideline and that they’ve easily gone over this limit. Many users go out with these with their dogs on board. Doggies of most sizes, even the bigger breeds, will fit with you when you’re riding. Where people seem to have issues is with the pump. The company is pretty open to changing out the pump if it’s faulty, but do watch out for this issue. Some users found it hard to find an electric pump that would fit with this model. Overall, for the price, you’re not going to do much better. This model has been made well and should last a long time. It provides a rigid surface that is similar to a hard board. The non-slip surface means that performing yoga is comfortable and safe. Overall, it’s good value for the money with this board, even if you do need to replace the pump.